there are five very important colors in my classroom. green, orange, blue, purple, red. it's my classroom management system. when i give you several warnings and you do not change your action, you change a color. you start each day on green. if you end on green, it means you've had a fabulous day. orange means you have a "serious warning." it's gets much worse from there. "ian told me it was a compliment." "Yeah, ian told me that an orange dot was a compliment." we laughed and i explained that orange was unfortunately not a compliment. poor little guy. poor teacher. he's yet to get another green. i'm sick. i'm just plain sick. i'll organize anything. if i see it, and it's near me for any extended period of time, i'll organize it. it's a disease that has no cure. you don't believe me? i have proof. last night at the store, i bought a nice little plastic container of q-tips. the perfect thing for michael and i in our one bedroom living state. i opened the package last night so that i wouldn't make any noise for michael while i was getting ready. this morning, i reached for the q-tips on the dresser (from the floor), i grabbed the lid and as i pulled the container off of the dresser, the lid popped open, spilling the 14 million q-tips to the ground. i stuff them all back in in a way that wouldn't even permit the lid to close. 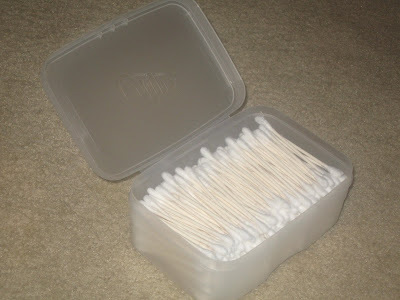 so, tonight, i'm sitting here watching tv and i catch a glimpse of the box, next to the mirror, overrun with q-tips. i brought the box to the bed, dumped out the tips and began replacing them. when i was finished, i shut the lid with a smile...and clapped. things are going well at school. there are a few kids that i'm worried about being totally annoyed with throughout the year; but for the most part, i think it's gonna be good. michael and i are still living in one bedroom in his co-workers house. we are eating out for every meal. we are ready for a home-cooked meal or just a peanut butter and jelly sandwich with hot cheetos (the spicy kind) and milk. we are trying to decide between an apartment and just spending a little more money for a rent house. our house still hasn't sold and i've built a wall so far between me and the selling of the house, that i usually don't even remember that we have a house on the market in san angelo. i have new blisters on my heels from new "more comfortable" shoes. living in a classroom without a printer is really, really hard. i miss marme and daddy, landon and sarah and ellie, matthew and mandy. i don't want to drive this weekend, but i wanna go home. when a window unit and a blow dryer are plugged in and turned on in a fan/lit room, you cannot have a cell phone charger plugged in as well without blowing a fuse. your husband gets cranky when you ask him to get out of bed at 5:45 to go flip the switch to a blown fuse. ocean's eleven is a really good movie. my new bed time is about...uh...right now. watching kids practice writing their abc's. especially when they look to the board after each letter to see what comes next. i fell in love with one of my little boys the first time i saw him at meet the teacher. he is really short, tanned little face and white blond hair (he reminds me of my handsome mason!). his name is shaun. he came to school crying the first day. it's a little hard to leave mom after being with her for a whole summer, ya know?! 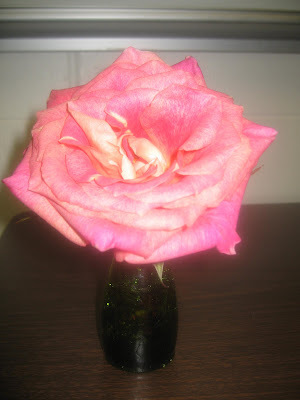 he came to school crying, but he brought me this beautiful rose. how lucky am i? right now. story is following right now. we go to recess directly after lunch. someone usually cries at least once every other week at recess. everyone is always "hurt" and something is always "wrong". josh came over to tell me that courtney was hurt. she eventually found her way over to me. she wasn't hurt, she was just crying hysterically and saying she missed her mom. i kept trying to calm her down and eventually told her to go in and go to the restroom. i let her take another girl with her. i watched them as they walked towards the door and back out to the playground, back towards the door and back to the playground once again. by this time, it was time for us to line up and go inside. when we made our way back in, we stopped at the restrooms for a break. courtney was next in line and had quieted her crying quite a bit (because i told her too because she was loud in the hallway) when out of nowhere, she throws up all over the floor. gross! poor baby. i don't think she was really sick. i think she just worked herself into a frenzy and made herself sick. i felt really badly for her. her mom said she was fine the rest of the day. i never did eat that apple. okay, i know. it's about time. and it is, it's the exact time. it's school time. my first day in first grade at steubing elementary was a little crazy. i think the craziest part was just the schedule. it's just that we have our rotation (like pe and music) time at 9:30 in the morning. that should always be an afternoon time for young kids. especially because they're the most awake in the mornings and that's the best time for teaching, not physical activity. but, oh well, we're stuck with what they give us. anyway, the first day wasn't too bad, just a little less organized than i usually prefer my classroom. the second day was much better and today seems like things are starting to get normal. by the end of the week, i am hoping for a normal day fulfilling all of the parts of my schedule. i'll let you know how that goes. i've ended up with 18 kids and it feels great! that's a pretty low number for me. i'm used to the full enchilada (22) all year long. 10 girls. 8 boys. perfect. too many boys=too much chaos. too many girls=too much drama. this might be a pretty good combination. seems to be so far. i'll let you know how that goes too. my coworkers are really awesome and i'm enjoying getting to know them. i do miss my friends from lamar though. i don't know if i'll ever forget them, they're so wonderful. but these gals sure make good friends. so, for the first three days of first grade 2007-2008 i'm pretty happy. 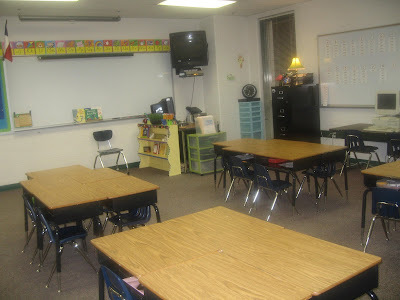 now, pictures of my classroom. 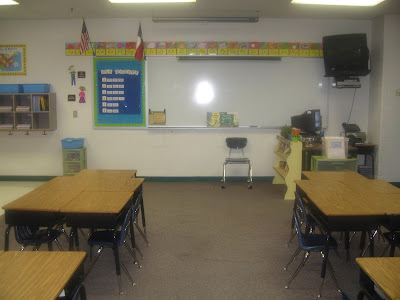 the view of classroom kotze from the door. the view from the reading station. the front of the room. my little nook (it took me forever to figure out what to do. i kept wanting to change it but nothing else ever worked!) i like it now! there ya go...classroom kotze in a nutshell. have a great first day of school. hope it all goes well! i'm thinking of you...in my spare time of course. well, i stayed at the school all day today. 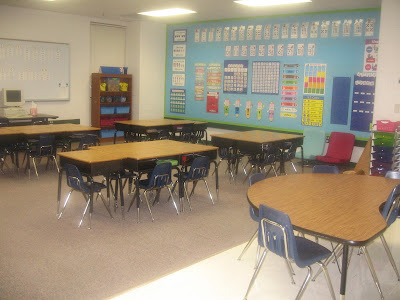 i worked as much as i could and, of course, my classroom still isn't all the way ready. i really am ready for it to be done. i am hoping to get everything finished by tomorrow at 4:30. that's meet-the-teacher time. it lasts until 6 and then michael will be going to san angelo. i am hoping to be able to go with him. one last weekend before school starts. i'm hoping for one last weekend at home before i begin another year. you may not realize this, but teachers could probably spend two weeks straight, 10 hours a day in their classrooms before school starts and they probably still wouldn't be ready for the first day. i need more time. also-NISD held our convocation today. we were the last one to be held for the 07-08 school year. there were 8 before us. 12 schools attended each convocation. that's alot of schools! there are 80,000+ students in northside. this is the fourth largest district in the state. it's way different than san angelo. but, in it's own way, it's cool. the superintendent here is really good. he takes everything very seriously. i was just really impressed with him today. he led the whole thing. there wasn't someone else there in charge with him as the guest speaker, he was IT. he did the whole thing. it was like a huge pep rally and it was really cool. it was fun. i had fun. but, I NEED MORE TIME! there are days when i just really miss my sister. today (and the past few days) is just one of those times. she is my first sister and the best one i could wish for. however, today i am missing ellie too. i need to see them. it's time for a girl's weekend so we can shop and hang out and just sit around and do nothing but talk (sarah and i are really good at that!). i can't wait until we get to do that again. i hope it's soon! sister- i miss you so much. you are so special to me and i am truly blessed to have you in my life. thanks for being who you are and for being such a wonderfully, fabulous friend. you're the best. i love you so much and can't wait until we can get together again. it's time for some serious talking about nothing serious. ;) i love you, sister. my uncle's funeral was yesterday in odessa. my first day of inservice was yesterday in san antonio. i didn't know what to do so on friday, i emailed my principal and asked her to tell me what to do. she answered, "family is the most important thing. go to the funeral and do not worry. everything will be fine." it's just nice to know when you work for someone who is not only still human, but who actually cares about those that work for her. i never thought i would be so ready to live in an apartment, until now. it's just hard going from a house to one bedroom and a bathroom that you must share with a couple of other people. it's also hard going from a king sized bed to a full sized bed. for the past two weeks, i have woken in the morning, taken my shower, and come back to michael's room to get ready (super quietly) while michael continued to sleep (that's including use of the blow dryer). plus-we don't really go downstairs unless we're leaving so we don't use their kitchen. which means we eat out all of the time. i am sick of out-to-eat food. anyway-it's great to have a place to stay while we're in transition, but man i'm ready for apartment living. yikes. i've had this favorite snack since jr high. i have now (and quite easily i might add) transferred my love for this snack on to michael. we eat it a lot more often now. this weekend while i was in odessa, i quite snobbily told amy that she must update her blog more often. i then noticed it had been 5 days since i'd done that to mine. my camera is still in my dresser drawer in san angelo. i stink. the classroom chaos has gotten a little better, i must say. i got to the school this morning and worked straight through lunch. i left there about 4:30.
there is still a pile in the middle of the floor, but for the most part it is starting to look like a real first grade classroom. i'm just ready for my computer password, so i can see if i'll be able to check blogs at school. my cousin, amy, has been faithfully reading blogs for the past five months. 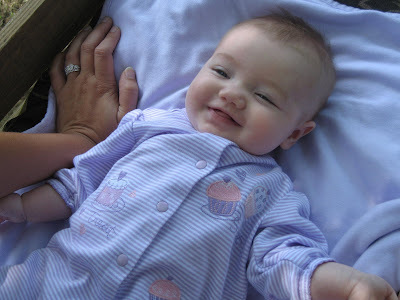 i've tried on numerous occasions to convince her to begin her own blog. enjoy, it. i know i will. hey gals...don't forget that we're having the wilde baby shower this saturday at 2pm in the SFLC. we want everyone to be there to show this great gal how much we love her and the new coming baby boy. she's registered at target, and i'll be making melt-a-way cookies. if you don't know what they are, you should come taste one. they're fabulous. yummy! see ya there sweet ladies! i spent the afternoon moving all of my stuff from the trucks to my new classroom. it 's a little smaller and has less storage space, but it will work. i meant to take pictures, but guess where my camera is...exactly where it's supposed to be. in my dresser drawer...in san angelo. you will never understand the "before" of this room, if i make all of my stuff fit. it should be quite the project. oh well, i'm just ready to get the thing done! our realtor called us after the open house and said all went well. apparently there are no bad comments about our house. well, you know...other than the things we can't change like the back yard being a little on the small side. well...do you want a big back yard or more square footage in your home?!?! you decide. there were 16 groups of people that visited and one man wants to bring his wife back later. i hope it works out. we're praying for something to happen soon. we know it will. thanks for praying with us! i'm having to call in sick this morning as well. but i'm not actually...sick. michael's friends are in town and we're having an open house this afternoon. it's just kind of a really awkward time this morning. i haven't quite figured out how to juggle this house for sale thing with people coming and going all of the time. enjoy the service. i know it's gonna be great. so i've been thinking that a trip to the outlet mall in san marcos might be a necessity before school starts. you know...school clothes-cheaper. we could go early this week and be back in time for teacher inservice. michael and i went for a run the other day. it's pretty sad but it was the first run in a really long time. we both felt great. a little sore the next day, and you know nothing feels as good as muscles being sore because you used them. well, this morning we woke up and talked about running. we also talked about breakfast. michael sat down to watch the pga championship and i sat down to check blogs. two minutes ago, he walked into the kitchen. i can hear pots banging around and different sounds that make me believe our run has been put on hold and our breakfast is coming up first. something just feels so darn right about sleeping in your own bed and brushing your teeth at your own sink and watching tv from your own chair. don't take it for granted. be thankful for being in your own home every single day of your life. michael is an avid cuddler. i honestly thought i was, until we got married. now he swears that i never cuddle. he was saying this to my dad the other day and dad said, "she never has been." what kind of girl isn't a cuddler. man. you learn all kinds of things about yourself when you get married. when we first got married and i had to wake up early, i would slide quietly out of bed, as to not disturb my sleeping husband. then i started getting in trouble. he wanted me to hug him and cuddle him a minute before i got up. so, of course i started doing that. this week when i had to get up at 6:15, i would gently hug michael for a minute or so and then slide out of bed. 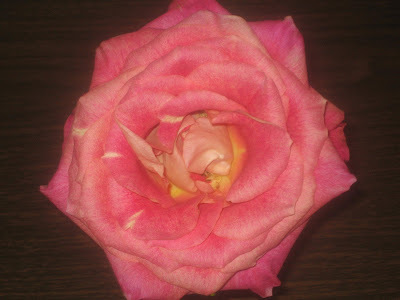 when i was ready i would sweetly kiss him and leave quietly with the room dark. this morning, i didn't have to get up and michael did. he got out of bed, took a shower and came back to cuddle with me for a minute. he cuddles and talks and touches. how can you stay asleep like that. so i woke up and talked to him while he got ready. then he left. i was wide awake. jerk. i am realizing why i'm not a cuddler. it's just asking for problems that a girl who loves her sleep doesn't want around. wow. it was broken! i promise! i promise! for those of you (ahem, A) who do not believe me need to check yourselves. ha! my blog was broken and i could not sign in. i couldn't even comment. didn't you notice that i wasn't saying anything?! anywhere?! come on, tell me you believe me. this will be embarrassing , but as my sweet, lovely sister pointed out, my husband and i do have some rather funny nicknames for each other. some have a story, others don't. but still...geez. "hi sweetie, zinzernko, en even enmolee 'en cakes 'en pie." "even" could mean love or various other things depending on how it's used in the sentence. don't ask, it's a long story. i met a few girls at this new teacher academy. one of them, linsay, is really nice and a great christian girl. we made sure we attended the past two days of classes together and we went to lunch together, along with a few other ladies. she's really nice. today after the academy, we went to lakeshore and a book store together. 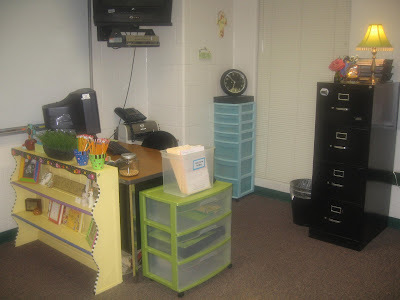 i spent a lot of money on my classroom...again. it was nice of her to drive me all over town so i wouldn't get lost. i think we will be good teacher friends. it's a nice feeling. thank you Lord, for good friends already. our house is officially on the market, again. after our open house, last sunday, michael's buddy came by and we listed our house with a realtor. he let us know that he showed it twice today. i'm hoping something happens soon, even though i would love to keep that house forever. we're still looking for something here. we're probably gonna settle for an apartment or something like that for the time being. hope it happens soon too! i am so super excited to be in he same town with my husband! is a terrible thing. it's bad anyway because the only thing anyone here can think about is their classroom and their To-Do list. while we are stressing away thinking of all of these things, there are administrators upon administrators talking away into a microphone. they talk about all sorts of things and most of it is boring. we sat for hours, tortured...tormented. it was painful. however, this day-the second day- was much better. we were split into clusters so all of the first grade teachers were together. the only bad thing was that the two girls that annoyed me the most from yesterday (the constant, exaggerated whispering in which you hear only the "sss" ) happened to be in the one room i walked in to...15 minutes late i might add. i'm going to have to get better at judging traffic. geez. anyway-today...we were in the first grade grouping being taught by...you got it! first grade teachers! they walked us through the science and social studies curriculum. this district rocks! the curriculum shows what dates to teach what and how to teach it. i mean, what on earth am i gonna have to do?!?!?! it seems to be done for me. it even tells me the materials i need, the questions to ask and what to do for prep. ;) i know there is still plenty for us to do and plenty to teach, but still...it feels pretty good. hurray! i still haven't seen my classroom here, but my classroom at lamar is cleaned out. not hurray. all of my classroom contents are filled to overflowing in my jeep and my dad's truck. they are parked nicely in my garage. see, this way, i didn't have to unload the millions of pounds of things only to load them again in a few days. okay-so, tomorrow...one more day of new teacher orientation. then, i'm as oriented as i am gonna be. wish me luck! blog is back on track. thank God. i missed you all and i'm sorry i couldn't respond to your mean comments and tell you why i wasn't posting. who knows why my blogger acts up so much, but it does. oh well, it's better now and that's all that matters. i just can't think of anything to say. thank you everyone for your encouraging words during this job search. thank you also for being so happy when i finally got a job. i really appreciate it.